At its core, good UX is founded upon a basic principle: putting your user at the heart of your design and development process. This sounds like a simple concept. But just think how many apps, sites and interfaces get it wrong, and frustrate you in the process. We’ve all come across these examples of poor user experience, and they can drive us to distraction, and often into the open arms of a more user-focused competitor. The problem is that, despite being a simple concept, this doesn’t make good UX easy to achieve, and getting it right will require a commitment to changes in areas such as research, design, testing, and evaluation. But please don’t be put off, because when you do get it right, you will have happier users and deliver a wealth of benefits to your business. To be able to put your user at the heart of your process you need to know who they are. Your marketing or sales department may speak up at this point, and explain how they already have in-depth target markets-but these are not personas. A target market is about establishing interest and/or viability within certain criteria, such as gender, age, income and location. Personas, though, are semi-fictitious identities of real customers or users, which­-although sitting in your ideal target market-will provide you with additional behavioural and psychological insight. You’ll need to know your target market before jumping into persona creation, but personas take you to the next level, and give you the ability to better understand and anticipate user behaviour. If you are working on a pre-existing site, then you’ll already have access to users, as well as demographics information (which can use to broaden your interview pool). If you’re working on a new product, though, a good course of action is to identify your competition, and approach their users as potential interviewees. At this point you should also identify how many people you’d like to interview-a good rule of thumb is to interview five people per persona. This is a vital part of the persona creation process, so please persevere. 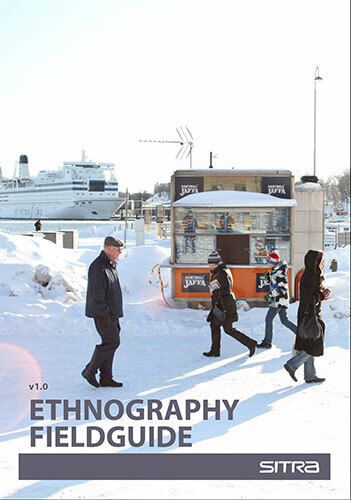 It can be intimidating at first, but interviews form the foundations for all qualitative research. And if you’re worried about what you’ll say, here’s the best bit: the most valuable interviews involve you saying as little as possible! Can you tell us more about your work, responsibilities, daily routines, etc? Can you tell us some background for this-how it all began? What are the most important practices or the best means? Why exactly these? What are the downsides or the biggest challenges? What factors have made it easier? Why? If you could change something what it would be? Why? What would you keep as it is right now? Why? Is there anything else that you want to say, or something that I didn’t ask yet that I should know? These are generic, and will need to be tailored to your own scenario, but-as you can hopefully see from these examples-the more open you keep your questions, the more useful your final analysis will be. Conducting interviews can be tiring, and transcribing them even more so-but don’t wait. The more time you wait between conducting an interview and writing it up, the more you will forget. Connections and thoughts you have during an interview will ebb away over time, and you may even have issues with clarity in your recordings, and have to rely on memory to fill in the gaps. 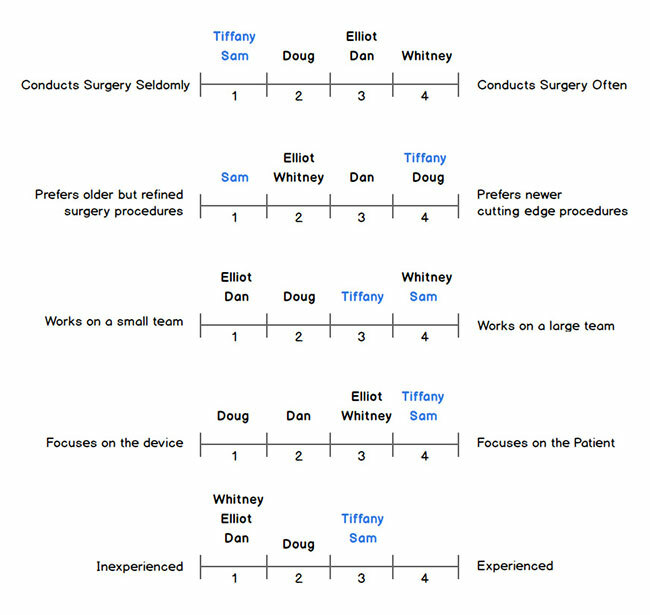 Having conducted your interviews, it’s a good idea to create a matrix for each interviewee. What are their needs and goals? What skills do they have? Where do they live and work? What are their pain points and motivation? What are their key behaviours? All of these can be equally useful, but it’s important to segment them. And over time you’ll find quick and easy ways to identify responses. For example, when looking at pain points and motivation you’ll find that responses are usually presented as non-continuous verbs (which includes words such as ‘like’, ‘love’, ‘need’, and ‘want’). Having completed interviews and written up your notes, it’s now time to work with this data in a more manageable fashion. That’s rights-it’s time to crack open the Post-it notes (other sticky notes are available). If you placed your research in a matrix earlier, this part of the process becomes much easier. 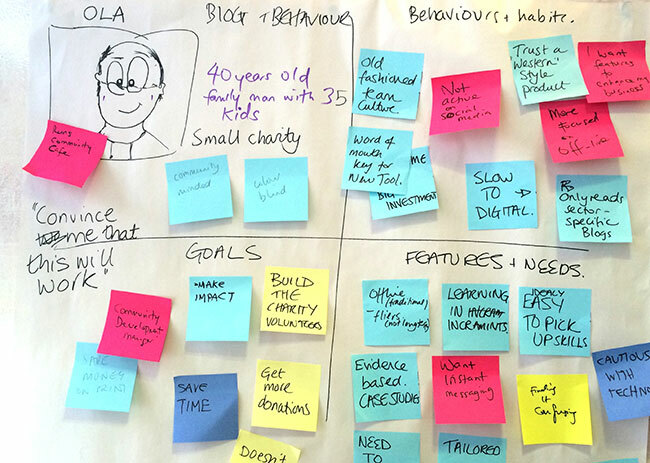 First, list a number of key behaviours and attitudes that you’ve identified in your user research. Then write up each behaviour variable onto a Post-it, and place them on a spectrum (part two of Shlomo Goltz’s persona guide has some great tips on applying this approach to your research). As Goltz points out in his post, try not to overlap different roles. If your product is aimed at people doing four different roles, don’t merge them (for example, compare writers with writers, not with designers). And as you add more Post-its to the spectrums you’ve identified, you should hopefully start to see users group together, at which point you can start building up personas based on their interview responses. Having gone through the previous steps, this is now a relatively simple and enjoyable part of persona creation. You’ve identified your users, sat through your interviews, analysed your findings, and now you can flesh out your user personas. Hopefully you’ve identified and prioritised a handful of personas by this point, but having a primary persona can really help when measuring decisions against your archetypes. 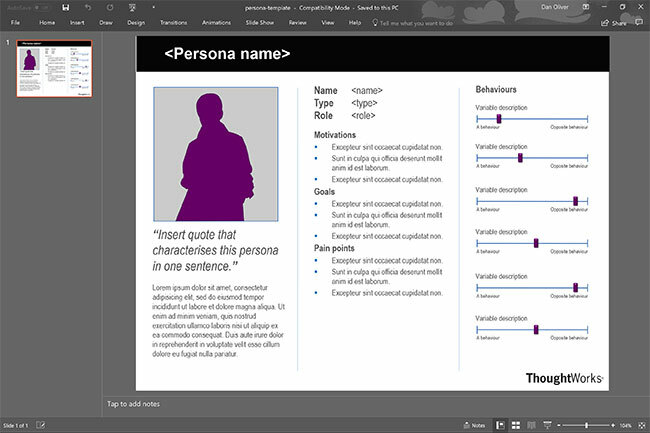 The technology consultancy ThoughtWorks has created a PowerPoint free to download persona template that provides you with a great starting point, especially if you don’t have a designer to hand. As is often the case when it comes to user-centred design, research is paramount, and the simple act of speaking to real users will provide you with a deeper understanding of how they think and behave. Put in the ground work, create a robust set of personas, and you will find that they eventually take on a life of their own, enabling you to measure your UX decisions against genuine user needs and goals. Dan Oliver is an editorial strategist and content marketing expert at Oliver Media, working with clients across tech, design, and development. Dan was previously editor of .net magazine, and he also founded Creative Bloq, the world's number one website for designers.